I know, I know, it's supposed to be computer-free Sunday in my world, but I haven't posted since Tuesday, and I do have a purchase from a Canadian, no less, quilt store, to share, as well as my (somewhat limited) progress on the star quilt. And it's morning somewhere...maybe Hawaii?! After hearing good things about Sew Sisters from Lorna at Sew Fresh Quilts, I signed up for their newsletter. Well, two months later, I made my first purchase. They have a special on right now until July 1 or while supplies last, on the charm pack, Oh Canada! from Stonehenge for $5. Um, that's amazing, even in the US, but for Canada? Pretty much unheard of. So, of course, I couldn't just order a charm pack and pay another $5 to ship it; I had to add something, right? And I do not have a patriotic quilt...yet. Gasp. So I went to their sale section, where fabric is $7.99/metre. That works out to $7.38/yard. Translate our CA$ to the US$ at the current rate of approximately 25% and you get $5.90 US/yard, decent, especially for Canada. I was looking for backings, and did a whoop! whoop! 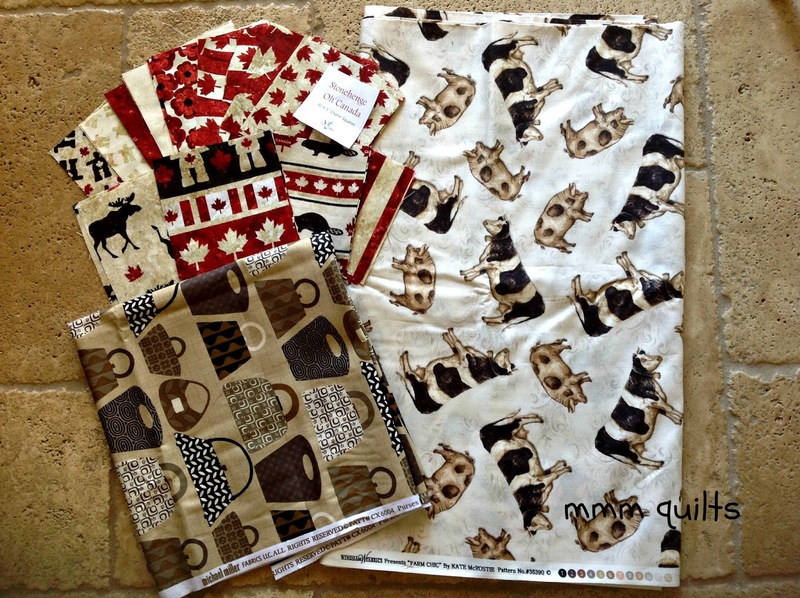 when I found the cows fabric, "Farm Chic" by Wyndham Fabrics. It's been a while (like 3 months) since I paper-pieced another cow, but have no fear, the 3 cows I have so far gaze/graze contentedly at me from my design wall, and yes, I am adding to the herd very soon, following the colour of the month at So Scrappy. This was a good score, so I bought 4 metres, aiming for a roughly 60" or so quilt for my aunt. The "Purses Galore" fabric from Michael Miller was another I bought with a bag in mind, be it makeup, or lunch, graball, what-have-you, probably for my daughters. Girls can never have too many bags, and makeup bags are right at the top of the list in their worlds. It was also in the sale section; I got the minimum 1 metre. Shipping was $8.99, which I thought wasn't bad for Canada. Had it been fabric.com, I'd have got my shipping free, since they ship free for orders over $35. I have a post coming with more price comparisons, just have to sit down and write it. I have spent hours and hours on the computer over the past few days, working on my grandson's movie from his trip here last September, and I'm so close to having it ready to burn to DVD...which means it could still be another couple of hours' work. Disappearing soundtrack credits was the last glitch, and I'm hoping I can fix that somehow in iDVD. Anyhow, long convoluted and frustrating story (I need to make more iMovies so I remember how to work the damn programme from year to year and update to update, lol; ya I'll get right on that) but the movies I've made for him are, if I do say so myself, freaking fantabulous, and he and Brianne watch them over and over. Heck, I myself have rewatched them more than a couple of times! Lots of ruler work, which is good for me. I know I don't spend enough time with Avril; hope to experiment this coming week with some scheduling ideas I've got. 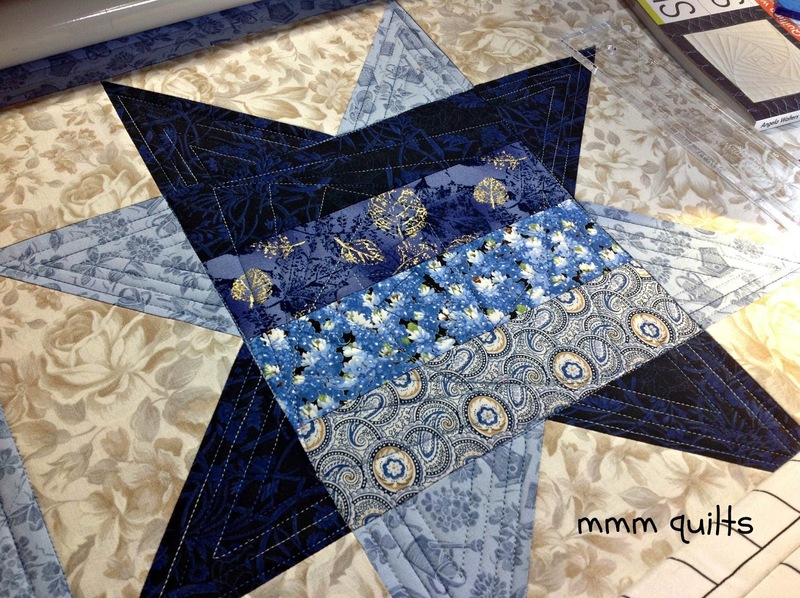 Linking up to the effervescent Molli Sparkles for Sunday Stash, whose post, interestingly, is about rulers among other things, and Confessions of a Fabric Addict for Can I Get a Whoop Whoop? Your star blocks are gorgeous! 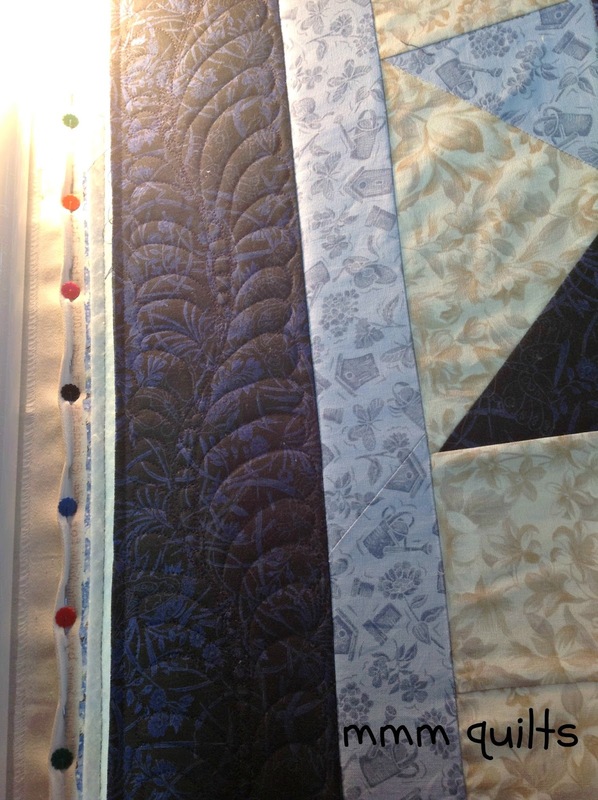 The quilting looks like rays of light. Fun, fun fabric finds, too! Rulers take a bit to get used to. When I first started using them, I had such a death grip on them, they (or a seam somewhere) would bump my carriage too. You will get used to them as you practice. I also find I have to use both hands on my rulers depending on the direction I am going. But it really does look great! Your feathers are beautiful! When I have had bobbles in my long arm quilting, I have found that the power cord gets stuck and drags on the rollers or some such. I have since devised a way with zip ties to keep it free and not able to move around and get stuck - maybe that is what you have going on or something like that?!?!? 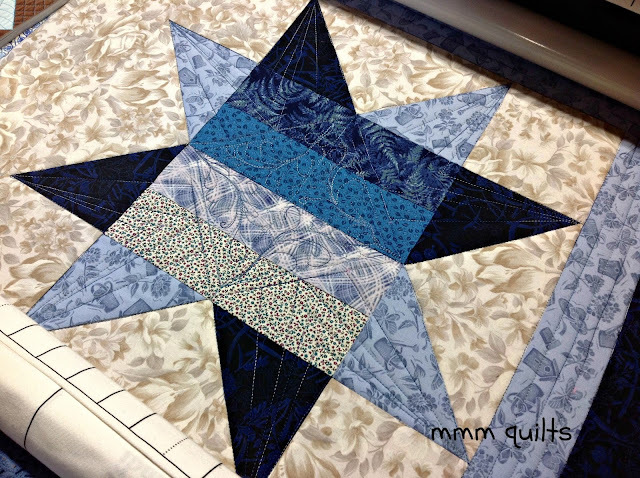 I really like your star blocks and I am a big fan of feathers, I think that your quilting is looking great. I'm liking your fabrics. You pay roughly 1/2 what we pay here in the UK for fabric. Mostly it's cheaper for me to order from the US, even with the high postage. I didn't even know what a bobble was, but in my ignorance I thought/think your quilted star looks great. Read your post last night on my phone and couldn't really see the fabrics, so came back this morning on my computer. So much fun to add to the stash! Your feathers look great! Your quilting is looking great. And I hope you solve the bobble mystery soon. I have gotten fabric from Sew Sisters and not been disappointed. Your feathers look great. Whoop whoop. I love the neutral fabric with the bees and watering cans, and the big stars are great. Sorry I can't help you on your bobble trouble LOL. Good luck!